I have to put Vegas into 2 parts. Part 2 will be the fun part of Vegas. Part 1 is the run. 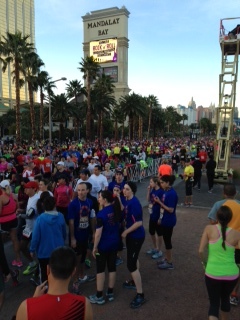 I went to Vegas to run the Rock and Roll Half Marathon. Last week I posted how scared I was because 4 weeks ago, I’d twisted my ankle; last week I pinched a nerve; and the day before I left, my lower back was killing me. I was not happy that I’d spent 2 months training and I might have to walk the whole thing. Luckily, my back and ankle felt great Sunday. 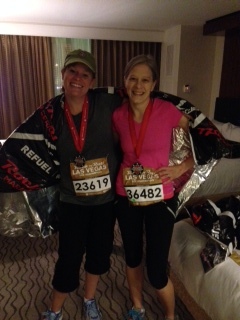 My friend Jen joined me and we headed to the start. My running buddies. I know all their names. There were 37,000 participants. You were supposed to line up with your carrel which is based on your estimated running time. Each group left every 2 minutes. For Jen and me to get to the right place, we would’ve had to walk half a mile and then we it would be more than a half marathon. We didn’t want to walk more than 13.1 miles. So we stayed where we were and decided we’d wait for our group to come to us. But then this nice woman from Chicago told us to just join her in group 16 because no one really cared, so we did. I knew if I stopped to take a photo, I was done. We ran at night. You run down the Strip, into a really dark neighborhood (on one street a small bus was just idling which not only created exhaust you had to run through, but also created uneasiness; and on another street I ran through cigar smoke. I didn’t like this little neighborhood.) and then back down the Strip to end at the Mirage. The farthest I’d run without walking was 6 miles. The farthest I’d trained walking and running was 10 miles. I decided to just see what would happen. The first 10.5 miles weren’t that bad. I really felt ok and I kept my pace the whole time. At mile 11 I wanted to die, but I’d made it back to the strip and I told myself just to make it to the Stratosphere. Then I made it to Circus Circus. Then I made it to Treasure Island. Then I made it to the second stoplight. Then I made it to the finish line. I couldn’t believe it! I’d run the whole thing. I’d booked a room at the Mirage because it said it was the finish line but it really wasn’t. Because after you cross the line, you pick up your medal. Then you walk through a water station. Then they give you a metallic blanket because there was a chill and you’re dripping sweat. Then you walk past the Gatorade. Then the finisher pictures. Then the chocolate milk. Then the power bars. Then the bagels. Then apples. Then pretzels. Then the beer. Then you had to wait for the light. Then I had to double back and pass all of this again outside the barricades to get to my hotel. A lot of people went out later that night. Jen and I went to bed. We’d both just done something we never thought we’d do in our lives and really don’t completely understand why we decided to do it in the first place. But I’ve got to say it was the best way to do a half marathon. I needed the 37,000 people because someone was always running and someone was always walking so you felt pushed but faster than someone. There were bands and music every mile and there were tons of water stations. 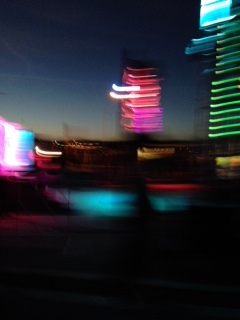 And there were the lights of the Strip. It was a great night. And now I can say I ran a half marathon. Congratulations! I do my running vicariously, through you.